Cliff Berkman is taking aim at prostate cancer. The Washington State University chemist is using part of the cancer cells themselves as a bull's eye, targeting a protein that occurs on prostate cancer cells and nowhere else. The protein, called PSMA (Prostate-Specific Membrane Antigen), shows up as soon as prostate cells become cancerous. PSMA is different from PSA, the prostate protein that is currently used to diagnose prostate cancer. PSA is released by prostate cancer cells into the bloodstream. PSMA stays attached to the cancer cells, like a neon sign saying "CANCER HERE!" Since PSMA is so specific to prostate cancer cells, Berkman thought that interfering with it might be a good way to fight the cancer—slow its growth or even kill it. So several years ago he set out to design compounds that would inhibit PSMA. He knew that PSMA cuts bits off the ends of certain other proteins, and that the protein being cut rests in a slot in the PSMA. Berkman figured if he made a compound that fit into the same slot but could not be cut, it might block PSMA from acting. With the slot occupied, PSMA couldn't do its job, and the cancerous cell, now without functional PSMA, would die. That was the plan. It worked fine, right up to the last part. "We made a bunch of inhibitors—super inhibitors," says Berkman. He added his compounds to prostate cancer cells in culture, and they completely blocked PSMA action—"but nothing happened," he says. "The cells didn't care." The experiment nearly killed that line of research. "We almost canned the program," he says. "I sat in my office staring at a white board for about three weeks just trying to figure out what I was going to do next. [Finally] I thought, OK, we have these compounds. They bind really tightly to the protein. The protein's a biomarker for prostate cancer. Why not use them as a delivery vehicle for bringing other things to the tumor cells, like therapeutic agents or imaging agents?" While one end of an inhibitor slips deep into the slot on PSMA, the other end dangles free. It can carry a payload such as a fluorescent dye that could show doctors where the tumor cells are, or a drug that could kill the cells. Berkman has now made a whole series of inhibitors with other substances attached to them. He's shown that the inhibitors bind to PSMA even when a large payload is attached, and that the combination of inhibitor-payload-PSMA actually moves into the cell. "That's the thing we get excited about, because now you have a way to get something bound to the cell you want, and then get it inside that cell," says Berkman. 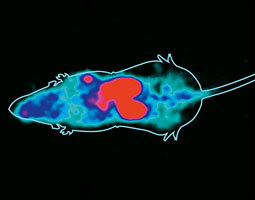 He's especially interested in payloads that could reveal where the tumor is, or that would attack the cancer cells. Working with WSU chemist Paul Benny and veterinary oncologist Jeff Bryan, Berkman is developing new imaging techniques using PSMA inhibitors. They implanted PSMA-bearing cells into one shoulder of a lab mouse. After letting the cells form a tumor, they injected the mouse with an inhibitor carrying F-18, a radioactive isotope of fluorine. It would circulate through the body, binding only where it encountered prostate cancer cells. Two hours later they did PET scans (Positron Emission Tomography) of the mouse. The F-18 would show up on the scans as bright red. In the PET images, the kidneys and bladder lit up red, because much of the inhibitor had been filtered out of the blood and was being cleared from the system. More important, the tumor in the left shoulder was red. The rest of the body was clear of F-18. It's just the kind of image Berkman was hoping for. He is now designing inhibitors that will not end up in the kidneys so quickly, in hopes that more will become concentrated in the tumor. He's also starting to test "therapeutic" payloads that battle the cancer. One approach is called photodynamic therapy. He attaches a "photosensitizer" chemical to the inhibitor, lets the inhibitor bind to cancer cells, and then exposes the cells to light. Light causes the photosensitizer to release free-radical oxygen, which damages the cancer cells. This strategy has been tried before, with photosensitizer circulating throughout the body. The problem has been that the photosensitizer gets into many kinds of cells and the damage is not confined to the cancer. Berkman's inhibitors make it possible to place a photosensitizer only in the cells he wants to kill. He's already shown his technique works, in general terms. Now he's working out details that will have to be known before proceeding to clinical trials. For example, too rapid an attack can provoke a harmful inflammatory reaction in the patient. He's aiming for a slower, more measured attack that would cause fewer unpleasant side effects. This year, Berkman and his colleagues were awarded a grant from the state's Life Sciences Discovery Fund to pursue their imaging work. The major aim of the LSDF program is to help scientists bring their ideas closer to commercial viability. "The objective [of our grant] was to get us to a stage where we have some candidates for clinical trials," says Berkman, who had approached investors a few years ago. "In my initial contacts with venture capitalists, they had recognized the potential for this work, but they felt it was early technology. They needed to see that it would work in an animal before they'd get excited about it. Now we're starting to get there."